Hurricane Sandy left some of us with severe property damage. If you saw no damage, be grateful and use the opportunity to plan. This storm was a reminder: hope for the best, but always plan for the worst. Now is a good time to review your car and homeowners insurance policies. Call your insurance agent and ask how your policies would have protected you if you saw property damage during Hurricane Sandy. Don't forget to ask them about your hurricane deductible. In Massachusetts and 17 other states, insurance companies can set a specific deductible for hurricane damage. Read more tips on our blog. 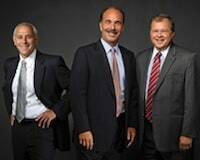 Breakstone, White & Gluck announces Marc Breakstone, David White and Ronald Gluck have again been recognized as Super Lawyers. They were recognized as among the top personal injury and medical malpractice lawyers in Massachusetts and New England. Click here to read more. Super Lawyers recognizes the top 5 percent of lawyers in the state annually and publishes the list in Boston Magazine. The selection process involves nominations from other attorneys and evaluations of peer recognition and professional achievement. Read and Follow Labels. Toys should have labels stating what ages they are appropriate for. Buy Large Toys. Do not buy small toys or toys with small parts for young children, especially under age 3. If a toy or part of a toy can pass through a toilet paper tube, it is too small for a child under age 3 and others who still put things in their mouth. Avoid Choking Risks. Toys with small parts or cords are dangerous near children, especially young children. Parents should carefully inspect mobiles, cribs and accessories for baby nurseries. They should also avoid toys with wind-up strings and other extensions. Avoid Toys with Magnets. If you have children in the house, avoid buying children toys with small magnets including adult desk toys with magnets. Ask and do your research because more toys contain magnets than you may realize, including magnetic building toys, toy darts and magnetic jewelry. Sharp Edges. Federal regulations prohibit sharp points in new toys intended for children under 8 years old. Avoid toys for older children which have sharp pieces and be aware of those for younger children which may be easily breakable into sharp pieces. Watch out For Noise. Avoid toy guns that are overly loud and ask about volume controls on other toys with sound features. Test the sound. If it is too loud for you, it is too loud for your child. Shopping Online. Make sure you receive what you ordered. Many online retailers have other vendors who provide and ship products directly. You may not know anything about the other vendor's customer service record. When the toy arrives, carefully inspect it to see if it has the proper labeling, matches the online description and all the advertised parts. Click here for more toy safety tips from U.S. PIRG. Breakstone, White & Gluck is a Boston law firm specializing in personal injury, medical malpractice and car accident cases. Visit our Practice Areas page to learn more.